The town of Bevagna is reported among “The most beautiful villages in Italy” and it was also rewarded by the Italian Touring Club with the orange flag, a distinguished prize that recognize the touristic and environmental quality and the welcoming atmosphere of Italian small inland towns. Bevagna has an ancient tradition and experienced its greatest splendor during the Roman era, when the plan of the city dates back to. Its name derives from the Etruscan word Mefana, later called Mevania by the Romans, meaning a city at the center of the plain. Cut off from the industrial development in the region, Bevagna has preserved virtually intact its medieval urban structure, which for the most part follows the plan of the ancient Roman town. It is well worth visiting the Roman theater, in which you can see the ruins of the two semi-circular ambulatory, and the Roman mosaic with marine scenes in the bath building, built in the second century AD.The main square, Piazza Silvestri, is the heart of the town and it is considered one of the most magnificent squares in Italy. 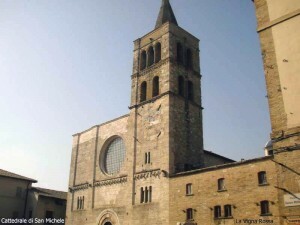 It is surrounded by three churches: St. Silvestro, St. Michele, both dated between the 12th and the 13th century, and San Domenico (XIII – XIV century). The Gothic Palazzo dei Consoli, dating back to 1270, is also notable: it is connected with a loggia to the Church of San Silvestro and since 1886 it has been the home of the Torti Theater, a small “living room” decorated by Bruschi and Piervittori. The current medieval structure of Bevagna inspired the organization of the Gaite Festival (the ancient name for the four town’s districts), which takes place every year in the last ten days of June and brings the town and its community back in time, in a very suggestive way. The Gaite Festival also offers tourists the opportunity to play the role and participate with medieval costumes that tailors provide. According to the moment you decide to visit Bevagna, you will find a vibrant and lively town in summer colors, or a quiet and contemplative one in the magical and misty autumn-winter atmosphere.